Who Are the Seven Shepherds and Eight Dukes of Mankind? Home/WT Review/Who Are the Seven Shepherds and Eight Dukes of Mankind? ← Why did an angel claim to be God? The main body of the Watchtower material presents an informative account of the historical developments leading up to the invasion of Judah by the Assyrians under their king, Sennacherib. The article points out that the king of Israel joined forces with Syria and was intent on removing the king of Judah – and most likely, the royal linage of David and the ancestral line of the Messiah. No doubt the Israelites were mere pawns of a satanic scheme to derail Jehovah’s purpose to produce a messianic king at some point in the future. After all, the Hebrew word translated as “satan” means resister – opposer. Everything the Devil does is motivated by his opposition to the establishment of the kingdom of God. But as is typical of the Watchtower Society their interpretation of prophecy is not so straightforward as their presentation of biblical history. It is, in fact, deceptive. How so? First, it is somewhat odd that the article under consideration uses the word “dukes” even though the new edition of the NWT has replaced “dukes” with “princes.” Despite that fact, the article makes reference to the New English Bible because it uses the word “princes.” Perhaps the article was written some time ago and was not revised to reflect the change in their own translation. Whatever the case, it is not that “duke” is an unacceptable English language term. Dukes in the modern peerage system are the highest order of rank and may or may not also be princes. The Watchtower, though, wrongly interprets the “Prince” as being Jehovah, whereas the series of prophecies in Daniel depict Christ conquering the last king in various ways, under varying guises; such as the Son of man, Prince of princes and Michael, the great prince. But, the princes – plural – in that prophecy are obviously the same as the holy ones who are brought to ruin by the king fierce in countenance. But the question is, are the princes or dukes referred to in Micah really congregation elders, as the Watchtower claims? And do they merely wield the metaphorical sword of the spirit, or something else? And if the symbolic dukes are actually Christian elders, in what way are they a “secret weapon”? It is always a good idea to familiarize oneself with the context of any passage cited. In this instance please read the entire 5th chapter of Micah. Assyria has relevance to the time of Christ’s return by reason of the fact that the Assyrian kingdom comprises one of the heads of the seven-headed beast of Revelation. Because there is only one political beast that has been in existence for several thousand years, which Satan has used to oppose Jehovah’s purpose on earth, and the eighth king springs from the seven, depending on the context the Assyrian may also typify the last kingdom in its opposition to the incoming kingdom of Christ. To place a finer point on it, Jesus was also put to death by the same beastly apparatus, which was then manifest as the Roman Empire. So, that is why it is appropriate to place the assault on the Messiah in the context of the invasion of the Assyrian, seeing that the conflict is ongoing – spanning centuries, only reaching a culmination during the conclusion. And because Christ sprang from Israel, at least in the flesh, (Israel is also known as Jacob) and the anointed are spiritual brothers of Christ, they are also known as “Jacob” – even though very few of the remaining ones now are actual Jews. Although verse two is in reference to the earthly birthplace of Jesus, the daughter under siege who is to give birth is not the human mother of Jesus. She is the symbolic woman who gives birth to the seed. That birth relates to the birth of the kingdom outlined in the 12th chapter of Revelation, which also depicts a woman giving birth while under siege by the Devil. Any sensible reading of this chapter connects the seven dukes of mankind with “the remaining ones.” That being the case, are the elders of Jehovah’s Witnesses comparable to a lion among flocks of sheep that “pounces and tears to pieces” with no savior? 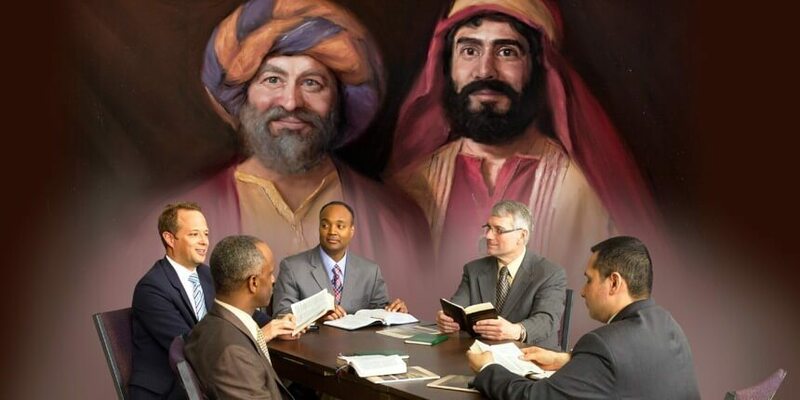 Or are Christian elders properly designated as the “brothers” of Christ? What, then, is the meaning of this prophecy? Are the gentle sons of the kingdom any more comparable to “a lion among the beasts of a forest”? This portion of prophecy is depicting something extraordinary; something of which the Watchtower has no insight into; something which Jehovah has held in reserve, which the new NWT appropriately refers to as “guarded secrets” – scheduled to be revealed at the “present time,” which is to say, during the revelation of the Christ, when the sacred mystery of God is brought to a “grand climax” – to borrow a phrase from the Watchtower Society. Even with all of their ballyhoo about Jesus having returned invisibly in 1914, not even the Watchtower is so unreasonable as to claim that Jesus has already been made manifest. And we may be certain that the manifestation of the glorious Prince of princes will not be a commonplace event. That being the case, what is involved with the manifestation of those who are in union with Christ – or the revealing of the sons of God, as it is also worded? The manifestation of the sons of the kingdom must likewise be a supernatural phenomenon. It is, then, those who are presently hidden in Christ who are the secret weapons. They will be a blessing to the friends of God and a bane to the enemies of Jehovah. At that time, the life-saving direction that we receive from Jehovah’s organization may not appear practical from a human standpoint. All of us must be ready to obey any instructions we may receive, whether these appear sound from a strategic or human standpoint or not. The Society attaches no particular importance to the righteous ones shining as brightly as the sun in the kingdom of God. They surmise that it merely has to do with them going to heaven. Truly, they do not have ears with which to listen. Jesus even alluded to their deaf and blind condition in the 13th chapter of Matthew, where he quoted from Isaiah, thus inferring that it applied to God’s people during the concluding harvest. In reality, the coming of Christ will be nothing short of earthshaking. It will unleash a torrent of persecution upon the remaining ones and fracture the Watchtower Society. As for the Watchtower organization, after having promoted a fake parousia for the entire time of its existence it will have no credibility when the actual parousia commences. Indeed, after having promoted a hoax for over a century, what lifesaving instructions could Bethel possibly have to impart during the actual revelation of Christ? On the contrary, in whatever form it will exist then in the post-crash world it will serve as an antichrist in opposition to Christ. Is not that what Paul foretold in connection with the man of lawlessness, that he is set in opposition and that he promotes a false parousia in advance of the manifestation of Christ? That is the setting in which the words of Christ will be fulfilled regarding ‘Many will be stumbled and will betray one another and hate one another,’ as a result of their not being able to see beyond the deluding influence worked upon them regarding 1914. And just as the apostate Israelite kingdom joined forces with Syria, and as Judas found common cause with Jesus’ enemies when the Shepherd was struck, we may expect the apostate core of the Watchtower Society to disown the owner who bought them and betray the true sons of the kingdom. This explains why the Watchtower obviously misinterprets the 5th chapter of Micah and wishes to convince Jehovah’s Witnesses that elders under the authority of Bethel will serve as guides during the great day of Jehovah. It is a trap! Not coincidently, Micah 5:1 similarly speaks about the judge of Israel being struck. In what sense is Christ smitten? As Jesus said, whatever is done to his brothers is done to him. Returning to Micah, verse three states that “he will give them up,” which is speaking about Christ’s brothers being given to the persecution of the last king, the antitypical Assyrian. But the question remains: What is symbolized by the seven shepherds and eight princes? Just as the literal Assyrian was vanquished by a heavenly warrior, the seven shepherds symbolize, not earthly creatures, but heavenly ones; namely, the princes of the great Prince – Jesus Christ – after the remaining ones join the “people of Israel” – the 144,000 – in the spirit realm. And the eighth prince represents the Prince of princes himself – the foremost prince – Michael. Just as Jesus is called the Son of man, even after his ascension, so too, the “princes of mankind” is an appropriate term to describe those whom God has bought from mankind to serve in his heavenly kingdom. Furthermore, in the 19th chapter of Revelation the very same phrase is used in connection with Christ destroying the nations. In that scene the armies of heaven are following the Word into battle wielding the sword. 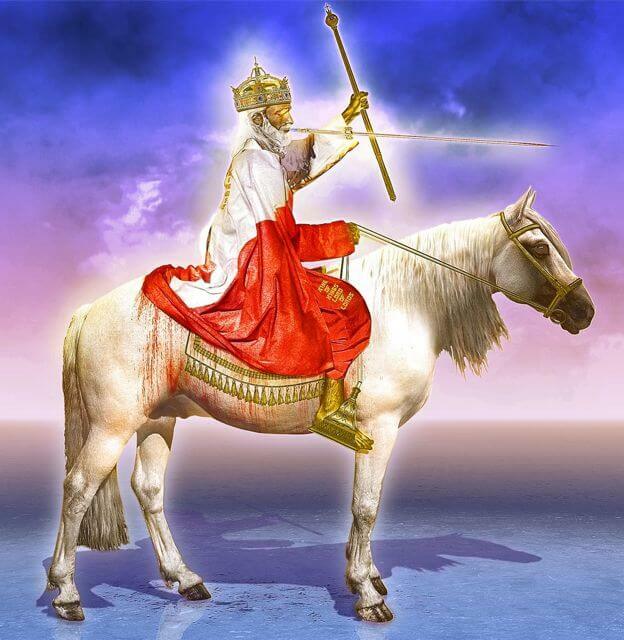 So, obviously, the seven symbolic princes who shepherd the nations with a sword are not an earthly army of elders, but an army of immortal, heavenly sons of God – an army of Christs, who will slaughter the beast and kill off the enemies of the kingdom. But prior to the remaining ones being martyred and changed in the twinkling of an eye from flesh to spirit, (does not the passage say that God’s weapon is not flesh?) they are like lions among lambs. In what sense? After being chastised and refined God will pour out his spirit in full measure, so that the sons and daughters of God will become spiritual Samsons, fearless and indomitable in their giving a final witness to Satan’s world. This phenomenon is what is foretold in Joel and symbolized in Revelation by the two witnesses. It is what is portrayed by the army of Abaddon being unleashed to sting the doomed. Did not Jesus foretell that his chosen ones will stand before kings and governors and no one will be able to dispute them, because the holy spirit will speak through them? It is this final witness, to be given outside the authority of the Watchtower Society, accompanied by the miracle of the manifestation of the chosen ones, that will be the basis for the “reports” that drive the king of the north, the Assyrian, into his genocidal rage and bring him into direct confrontation with Michael, the great prince and shepherd of mankind.